Phonographic Copyright (p) – Apple Corps Ltd. Copyright (c) – Apple Corps Ltd.
50th Anniversary 3CD Edition. New stereo mix by Giles Martin. ℗ 2018 The copyright in this compilation is owned by Calderstone Productions Limited (a division of Universal Music Group) / Apple Corps Limited. © 2018 The copyright in this compilation is owned by Calderstone Productions Limited (a division of Universal Music Group) / Apple Corps Limited. Artwork © Apple Corps Limited. 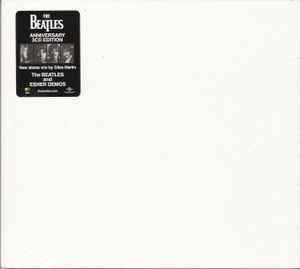 8-panel digipak with The BEATLES embossed on the front cover. Includes a 24-page booklet and an insert in form of a three folded mini-poster. There's a black hype sticker in the upper right corner of the factory seal, with a small black and white photo of each Beatle. Title as The Beatles And Esher Demos on both the hype sticker and the package's spine.